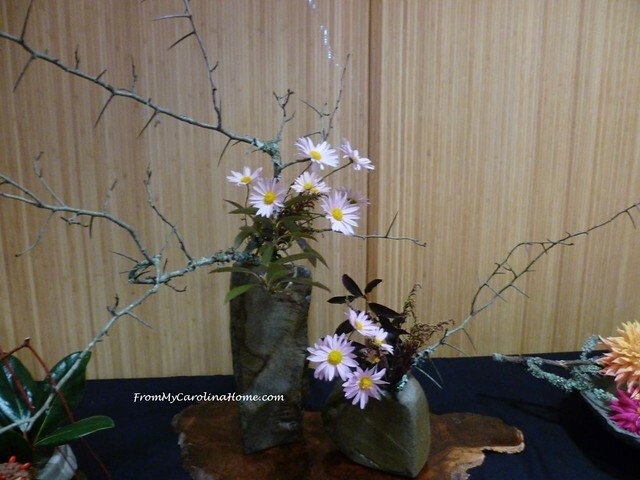 Ikebana is the art of arranging natural elements in a display. The art is over 500 years old, beginning around the time of the advent of formal gardens in Japan. Bringing the natural world inside is something we all do, picking flowers from the garden to display in a vase on a table, or bringing in pine cones to decorate for fall. 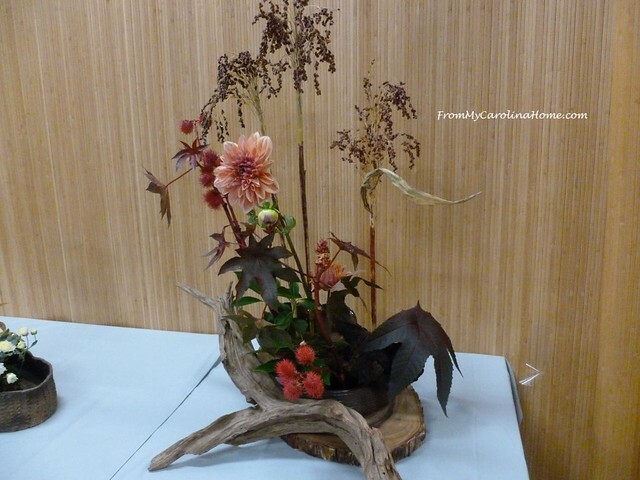 In Ikebana, there are many ideas, but as is usual for the Japanese culture, each element has meaning and purpose. 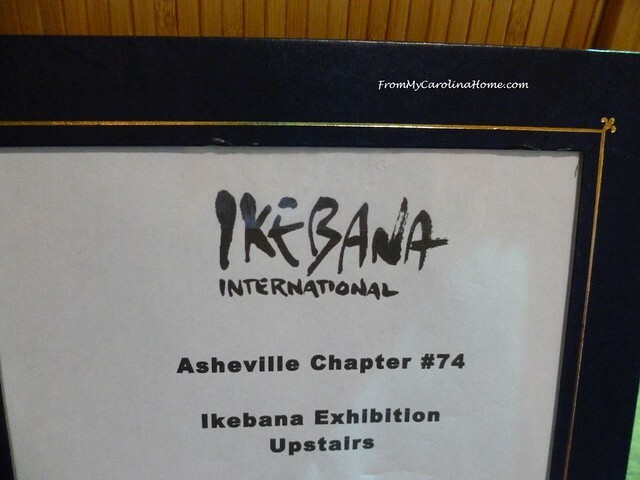 The Asheville chapter of Ikebana International held a show last fall, showcasing three schools of Ikebana – Ichiyo School, Sogetsu School, and Ichiyo School. Although the arrangements were labeled with the school, there was no information on how they differed. So, we just had to enjoy them as they were. 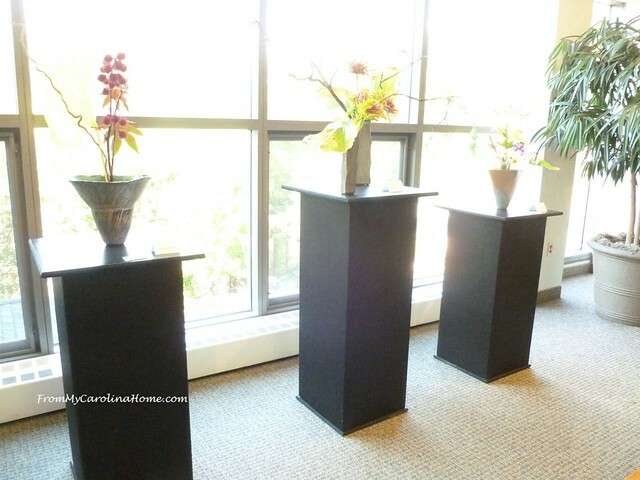 From research, common to most Ikebana is the overall triangle shape of unequal sides ( a scalene triangle), minimalism, and emphasis on shape and line over flowers. 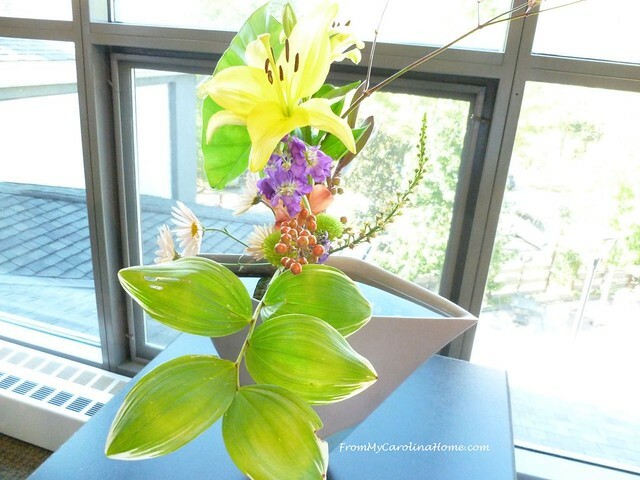 Generally, there are three stems in the arrangement. The longest stem called shin represents heaven and is one and a half times the longest dimension of the container. The second longest stem represents earth, called soe, and is three-quarters or two-thirds of the length of the shin, depending on which school is followed. The third stem called the tai represents the people, and is three quarters or two-thirds the length of the soe. 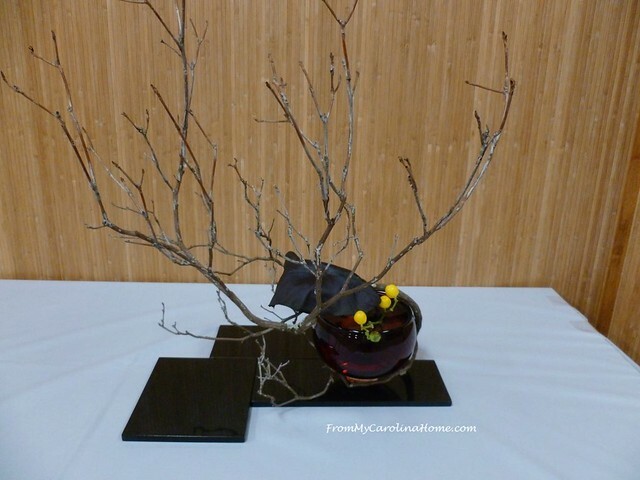 In some schools of Ikebana, the second longest stem represents man, and the shortest represents earth. 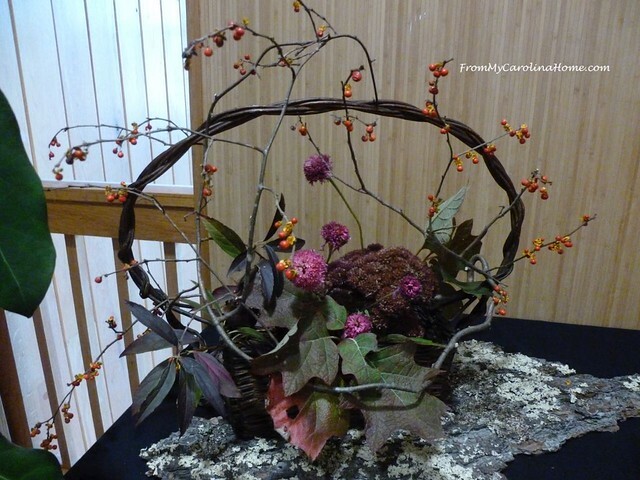 There are more than 3000 schools of Ikebana, with teachers all over the world, and many conflicting ideas between the schools. However, they all seem to have some common ideas. Shibui means subtlety. This one is from the Ichiyo School. Iki means original. 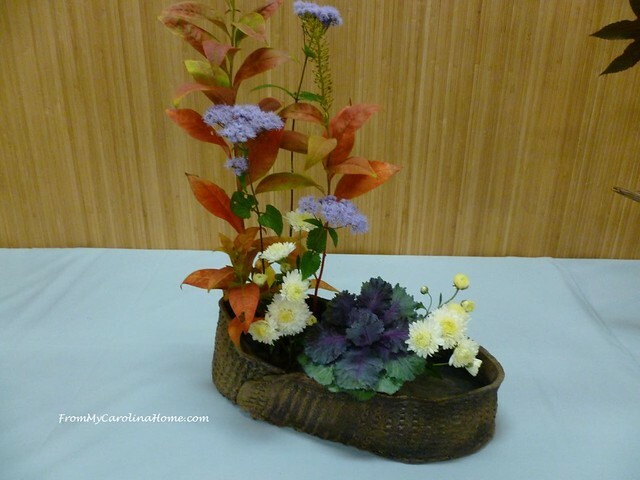 An artist from the Sogetsu School showed this arrangement, unusual in it is three containers with the shin, soe, and tai split between them. 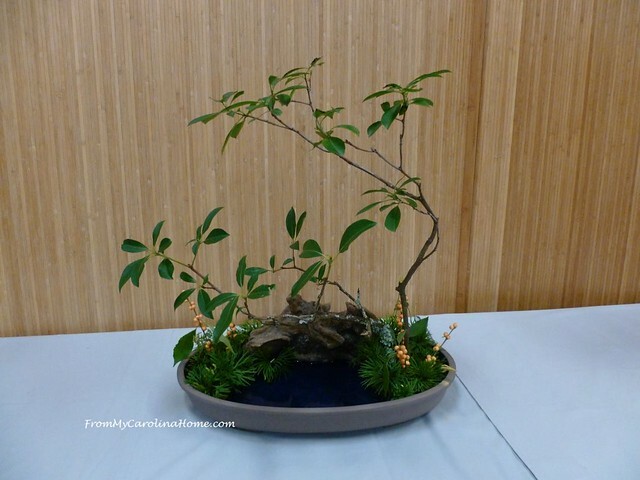 Ensou means void or negative space, and some of the arrangements drew your attention to what was not there, like this one with no leaves on the branches. Miyabi means elegance. This basket shape with the illusion of water at the base still has an unequal sides triangle shape overall with all the elements considered. Geido means discipline, resisting the urge to fill in spaces, limiting the arrangement to just what is needed. 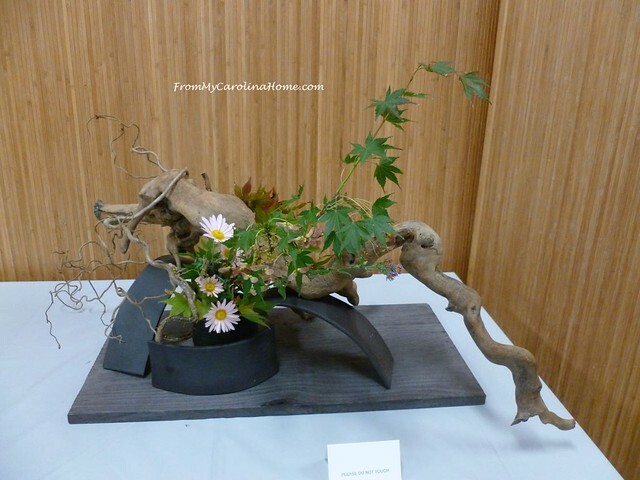 Some Ikebana reminded the viewer of bonsai. Yugen means mystery, depicted in this arrangement, the viewer may wonder where the water is coming from, and where it is going. Note the tall shin branch, 1-1/2 times the width of the container in total height, not in total length due to the interesting twists in the branch. Wabi-sabi means imperfection, perhaps in this arrangement a graceful line not perfectly straight, or some flower buds only partially open. Most of the designs conformed to the preference for odd numbers, particularly 3 and 5. 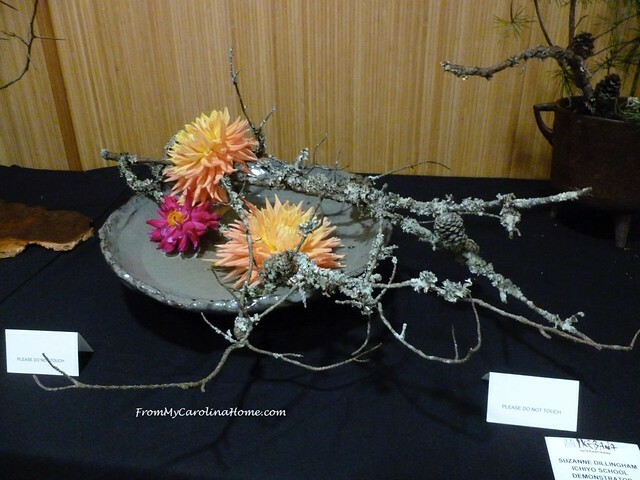 I liked this one with the lichen covered branches, and three flowers from an artist with the Ichiyo school. 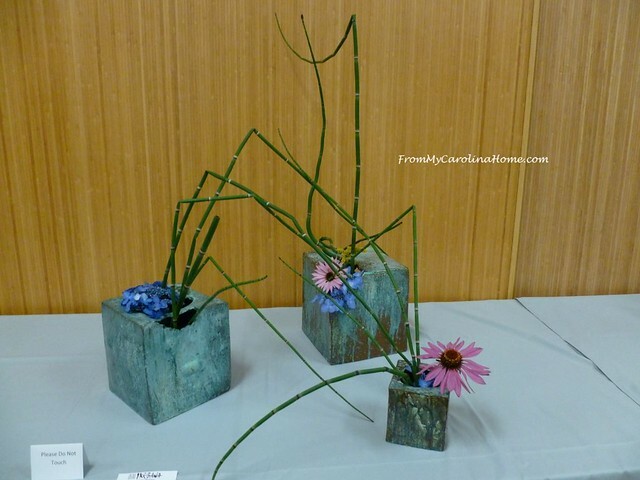 Near the windows, three more designs from the Ikenobo school of Ikebana. 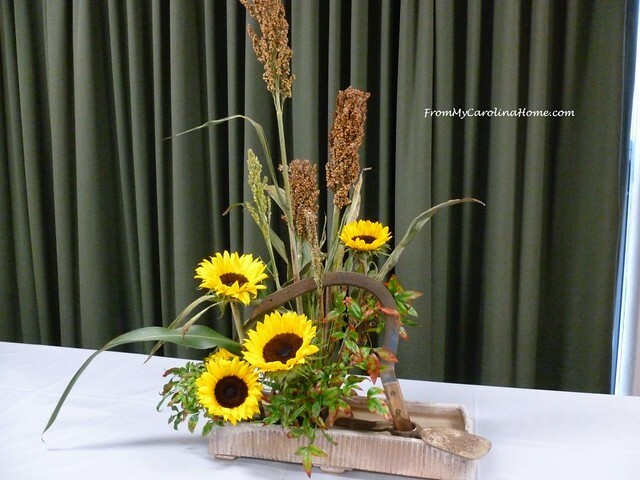 These used more Western ideas of floral arrangement. Vibrant colors in this final arrangement really capture attention. 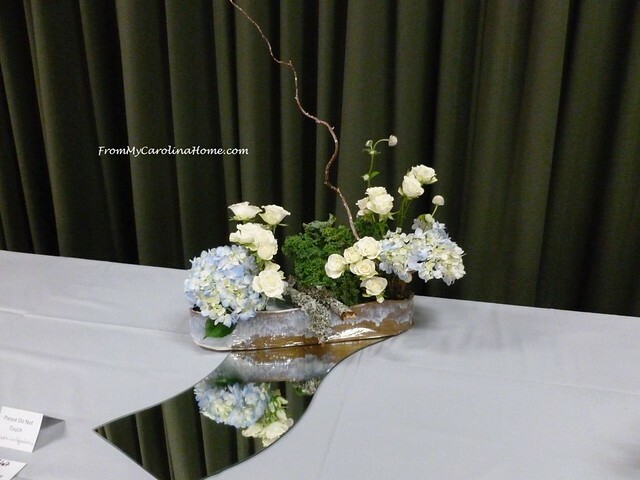 Do you like to do floral arranging? How very interesting. Somehow when I attempt flower arranging, the image in my mind doesn’t quite transfer to the finished product. However, I keep trying. What I think I like most about these is that they don’t use a large number of flowers. 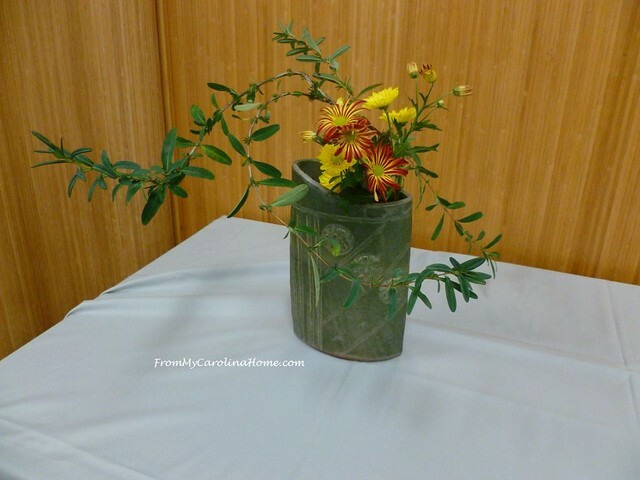 Adding interesting branches (free) and containers (could get at the thrift store) you could get by with a very economical amount of flowers. Thanks for sharing. 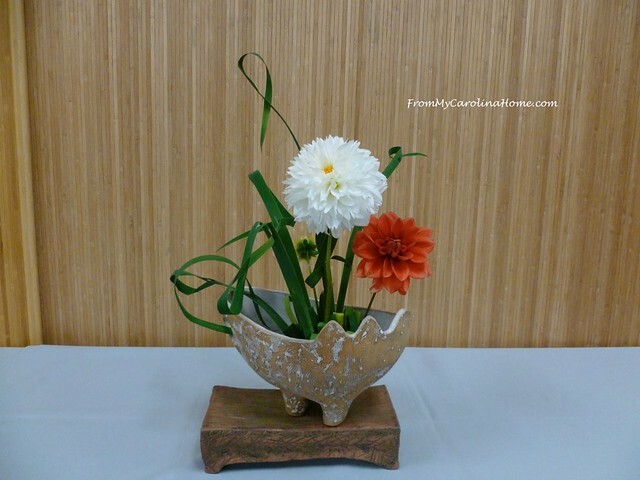 I just adore Ikebana. I have scanned in images from two books I found thrifting. I use the images on Facebook for my cover photos. Hello Carole: This was all very interesting and so pretty. I try occasionally to arrange some picked flowers in a vase. But, I am not very good at it. So, I leave most of my flowers outside and I enjoy the arranging that I do there. Which I do get better at every year. Thank you for sharing all of this and have a great day! I love to do this in the summer using my flowers / bushes etc. Every one of the displays is delightful!! 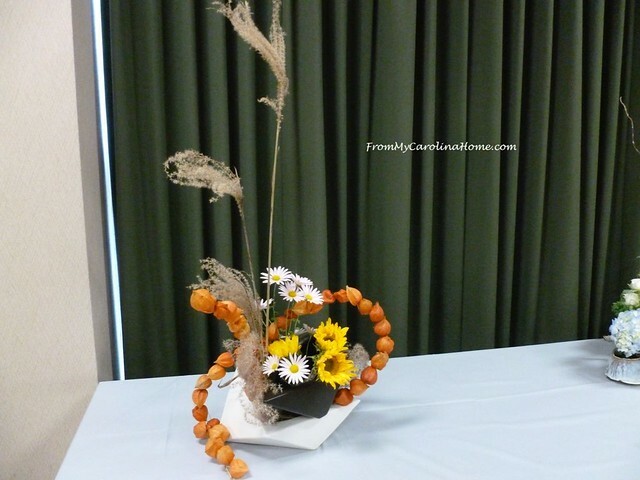 I made an Ikebana arrangement years ago at a floral class. I loved the apparent simplicity of it. 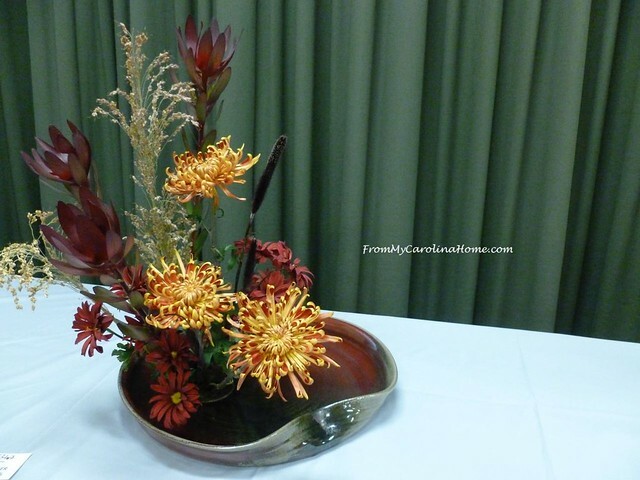 A beautiful selection of arrangements from the show you attended.